Dedicated May 2001 by Bishop of Durham, Rt.Rev. Michael Turnbull. Book of Remembrance, A4 size, bound in red with black spine and corners. 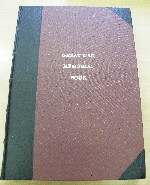 The words “Great War Memorial Book” are tooled in gold Roman capitals on the front cover. The pages are typed. Part 1 contains the introductions and dedications. Part 2-7 names the men from Sunderland who served according to the regiment in which they served. Part 8 lists the men from Sunderland who served with the Royal Navy and Merchant Navy. (b) Royal Flying Corps / Royal Air Force. regiment in which they served. Part 13 shows the names from Washington/Barmston/Usworth area. Since then, further pages have been found which add information to these lists. This is now listed as Part 14. This Memorial Book was Dedicated / by / The Lord Bishop of Durham / The Rt. Rev. Michael Turnbull / on / The 10th Day of May 2001. The gift of Roly Riddell to / Sunderland Old Township / Heritage Society for lodgement / in the War Memorial Chapel of / Sunderland Old Parish Church. 1. On Armistice Day 2000, the first bound copy was handed over to the Mayor of Sunderland. Another copy was presented to the City Library. This copy dedicated in May was a third copy. 2. Sunderland Old Township Heritage Society helped with obtaining a grant. 3. The three volumes are dedicated to the memory of Mr. Riddell’s daughter, Susan, who died at the age of 30 in 1996. 4. The volume was compiled after Mr. Riddell starting searching for information about his grandfather, Jacob Aldridge, who was killed and is listed on the memorial at Thiepval. Mr. Riddell was amazed to find there was no record of all the Wearsiders who had died in the Great War. 5. The church is now managed by the Churches Conservation Trust. Sunderland Echo 04/05/2001 reports story and proposed dedication “next week”; 11/05/2001 reports service of dedication. (Transferred to 168761 7th Home Service Coy. Labour Corps). (Transferred to 250560 501st Area Employment Coy. Labour Corps). 19-2-1919; interred at Mere Knowles Cemetery 27A 7037 (CWGC Regs. Sunderland KIA: F&F 24-5-1915 (CWGC Regs). 201219  Bugler Robert Ernest Settle, L: Sunderland; Died: Home Ex-P.O.W. Was in the 4th Battalion D.L.I. 12820   Pte. Thomas Gordon, b/E: Sunderland; KIA: F&F 16-9-1919;? 26207   Pte. Edwin James Horsfield Blackett, b: Sunderland; E/L: ? (Formerly 10936 Army Cyclists Corps). Convicted of desertion 23-11-1915;  Transferred to 12th D.L.I. interred at Mere Knowles Cemetery 21 149. 4-11-1920; interred at Mere Knowles Cemetery 25A 4742. DOW: Home 26-5-1917; (Parents & Wife L: Sunderland). interred at Bishopwearmouth Cemetery 3A ?